I've got a new breakfast favorite: Buttermilk in Geneva. They just opened a couple of weeks ago, we checked them out last weekend. What first peaked my interest was Buttermilk's branding. Any establishment with a good brand design always goes up a notch in my book. Being a breakfast place, they left the traditional egg kitsch behind and presented themselves in black and white with a touch of retro chic. The interior is clad in white clapboard with light grey ceiling and booths upholstered in black and white mod pattern. 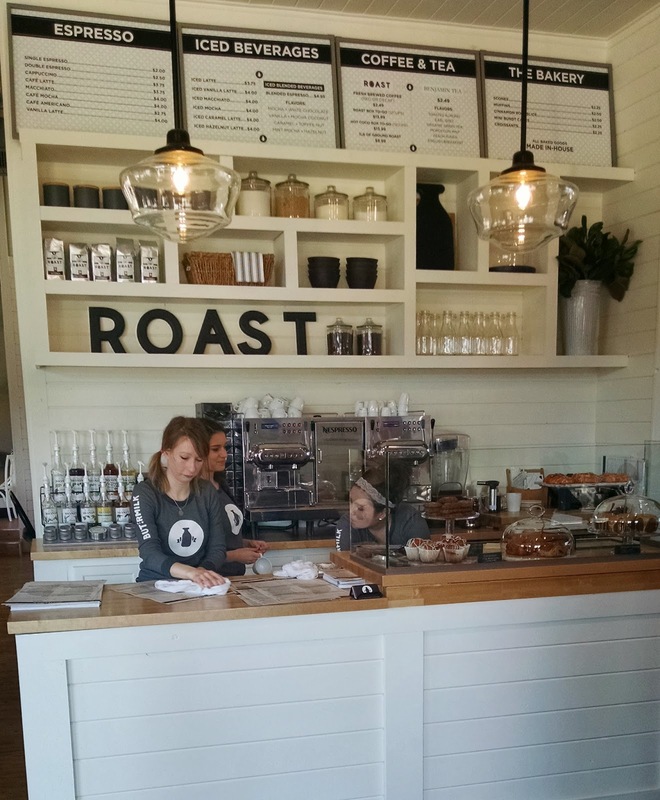 The staff is wearing a grey long-sleeved shirts with a large white milk bottle logo on the chest. The design of the restaurant is refreshingly monochrome, the only color is provided by the food, and an occasional customer's fluorescent running shoes. The space is light and airy with lots of large windows, the ceilings are high enough to absorb the sound – it just screams "hello beautiful morning!" The space between the tables is a little tight though, so leave the jogging stroller in the car. We got to Buttermilk around 10 am, and were told that the wait would be about 45 minutes. But, there is a place to sit and wait – a nice long corner bench by the window. And, the best part – you can get coffee and a baked good from the coffee bar to tide you over while you wait (although I wish they had orange juice there as well). The coffee is Nespresso. We are completely addicted to Nespresso, so we were quite impressed. Even the cups are Nespresso, your beverage is handed over in a vessel that has been specifically designed for that beverage. And there is only one other place in the state that has that fancy Nespresso machine. Terry had a cappuccino, I had a macchiatto. Danny got a cinnamon roll, that was presented as a cupcake (you can see them in the picture, just below the brownies). He was quite impressed with the presentation. And said that it was absolutely delicious. Why do I have a feeling that I will be making cinnamon rolls in a cupcake from now on? Our wait turned out to be about 30 minutes and it felt a lot shorter, because we were occupied with our tasty beverages and not packed like sardines into a small dark waiting area. We were able to check out the menu while waiting, but still were not ready to order right away because there were so many delicious choices! Well, Danny knew what he wanted right away: Cinnamon Roll Pancakes. 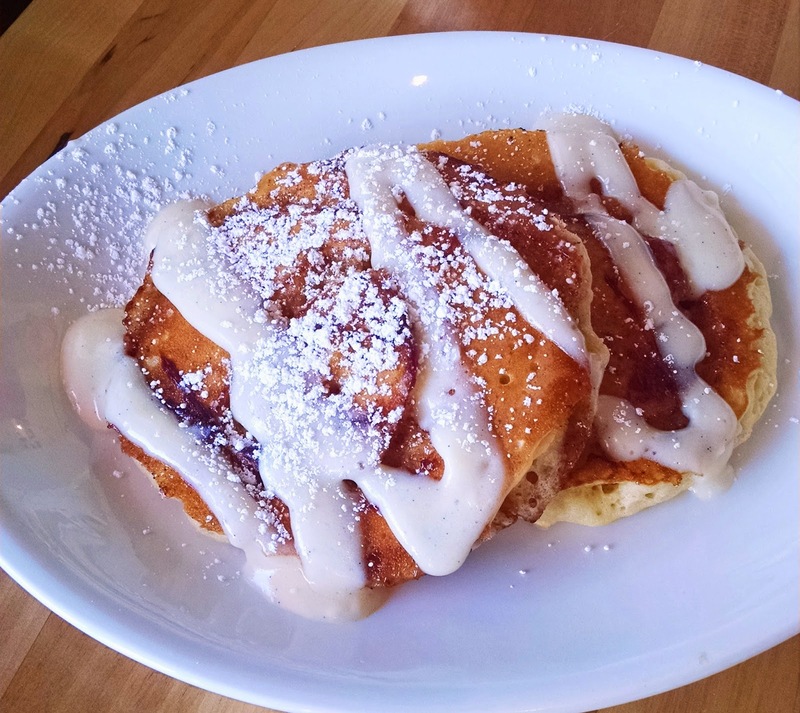 Cinnamon roll pancakes, child menu size. Yes, the pancakes do look like a cinnamon roll, and are somehow rolled with a layer of cinnamon butter. And covered in sugar glaze. Danny inhaled them, next time we'll have to order them from the regular menu so he could get a larger portion. After long debate, we decided on Corned Beef Skillet for Terry (house specialty), and a Way South Benny (eggs Benedict) for me. I asked our lovely waitress for her opinion on the Benny, she replied that all the Bennys are her favorite part of the menu. Mine did not disappoint. 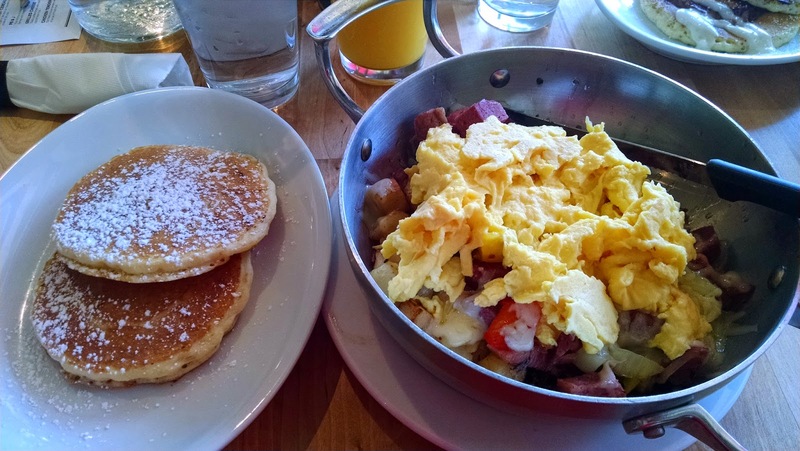 Corned Beef Skillet with a side of pancakes. The corned beef is cured in-house, it was moist and flavorful, and cut into nice large bite-size pieces. And the skillet arrived with a steak knife, although the meat was so tender you really did not need it. What impressed me most was the arrival of maple syrup to the table. It came in a white ceramic bottle of modern design, and it was heated. I am so doing this at home from now on! My Way South Benny was perfect! The chorizo sausage was just the right amount of spicy, mixed with diced tomatoes. The avocado was fresh and firm. The side potatoes were well seasoned, crisp and not greasy or dried out. 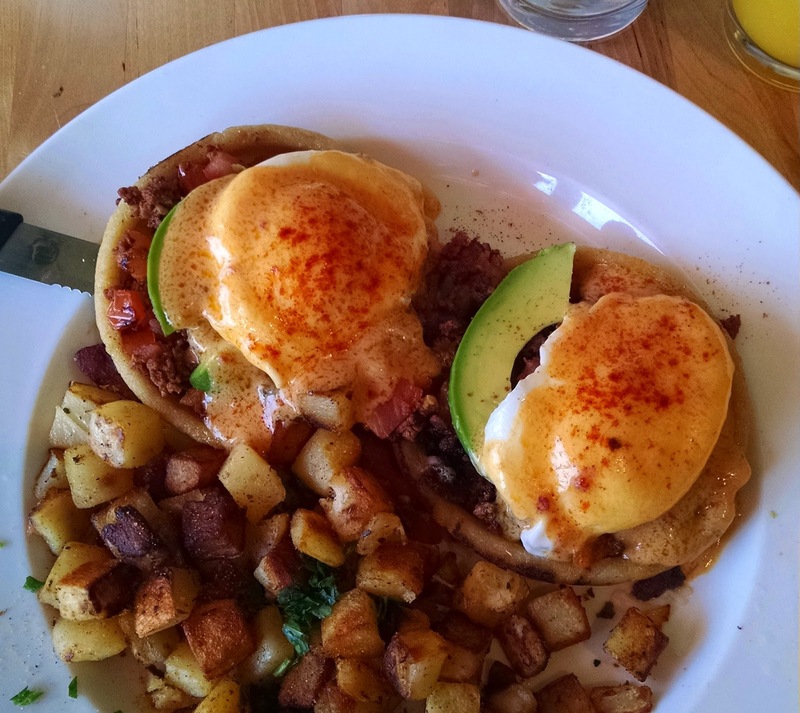 I usually don't order chorizo anything at a breakfast place anymore because of a previous bad experience, but Buttermilk had me at avocado with this one. And, I must say, it is a definite hit. At some point I asked for hot tea, the waitress told me that they only carried the regular and then proceeded to list "English Breakfast, Green..." I stopped her at English Breakfast, with a slice of lemon. Anywhere else – the regular is a bag of Lipton. my English Breakfast arrived in a nice white ceramic teapot with the tea already brewing inside. Perhaps next time I will listen to the entire tea menu, I am now really curious. Buttermilk's breakfast menu covers all the traditional morning favorites. From eggs to crepes, they've got it. It is a tried and true familiar menu, something that everyone craves, they did not set out to reinvent breakfast. What they did is use top notch ingredients cooked extremely well and present it in a modern and sophisticated way. They serve lunch as well, with a Cubano on the menu, I can not wait to check that out as well. 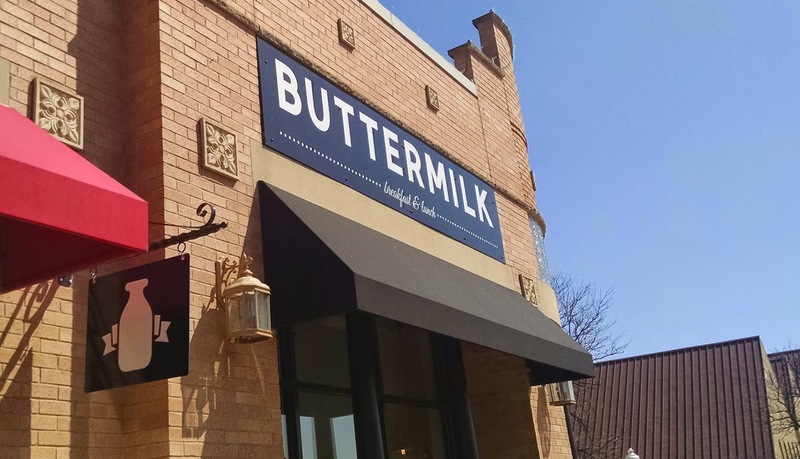 Buttermilk is worth the visit (and the wait).